To help celebrate the Christmas season and spread holiday cheer from our family-owned bakery to your family, Sunbelt Bakery will launch a “12 Days of Christmas” promotion on Facebook to reward fans of its Facebook page. 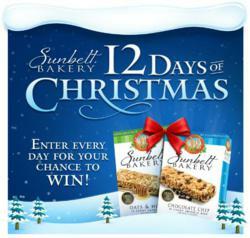 Starting on Dec. 13, 2012, Sunbelt Bakery will give away a free gift to one of its Facebook fans each day, with the promotion ending on Christmas Eve when someone will win a year’s supply of nutritious, bakery-fresh and delicious products from Sunbelt Bakery. “The holidays really are the most wonderful time of the year, and we look forward to giving back to our fans and thanking them for their support of Sunbelt Bakery throughout the year,” said Jeff Badger, brand manager for Sunbelt Bakery. To learn more about Sunbelt Bakery and its wide variety of bakery-fresh, no preservative snacks that consumers can feel good about serving and/or eating, visit http://www.SunbeltBakery.com. McKee Foods, a family-owned and family-oriented company based in Collegedale, Tenn., introduced the Sunbelt brand in 1982. The Sunbelt Bakery brand includes cereal and snack products, including chewy granola bars, fudge dipped chewy granola bars, fruit and grain cereal bars, and cereals. To learn more about Sunbelt Bakery snacks and cereals, visit [http://www.sunbeltbakery.com.